Hair Jungle hair salon, Plymouth are Official Keune Colour Specialists and Keune is our colour of choice in the salon, so you can be sure your colour will always be the best it can be! Keune Care: HAPPY, HEALTHY HAIR AT YOUR FINGERTIPS. You’re completely unique – and so is your hair, especially in its care needs. Whether it’s dull, frizzy, damaged or colour-treated, the solution lies at its roots in the most literal sense. Healthy hair always starts with a healthy scalp. 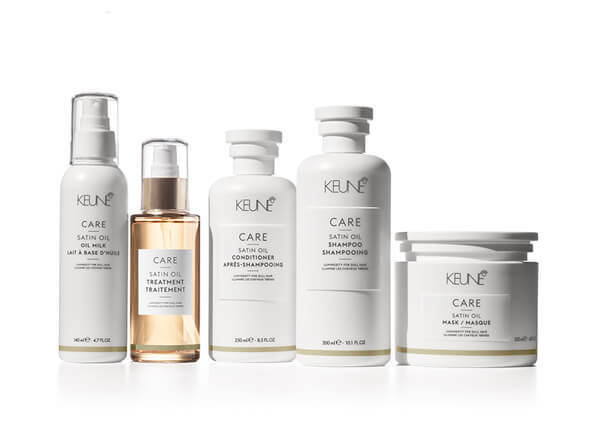 The Keune Care range features the best haircare products enriched with Essential Minerals that nourish the scalp and strands leaving your hair at its most beautiful, happy and healthy from the inside out. 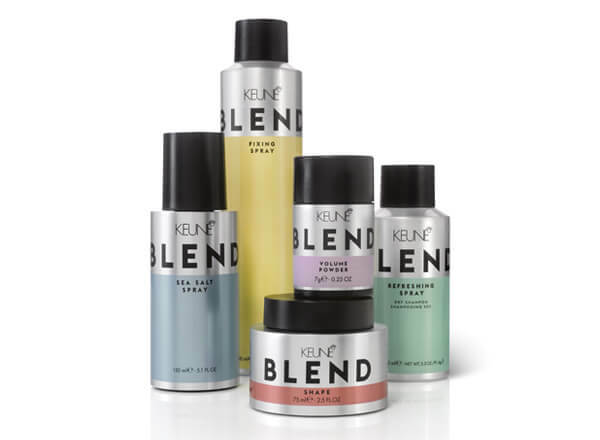 Keune Blend: High fashion styling and finishing products for hair that’s going places. Mess it up, mold it, make it completely your own. Hair styling is about mixing things up and creating a style to suit every mood, mode and moment. SMOOTH IT, CRUNCH IT, TWIST IT, PIN IT UP, you decide. Blend products are formulated with the highest quality ingredients suitable for all hair types, including colour treated hair. Containing a multi-vitamin complex, to give your hair excellent condition and fantastic shine while delivering hold and leaving hair easy to restyle. Milk Shake Integrity Shampoo is the perfect shampoo for all hair types. It will repair mild damage and dryness without stripping away any of your hair’s natural beauty. Add genuine strength and dazzling vitality to your hair with a natural beauty that can’t be found with regular shampoos. A natural shampoo for dry and damaged hair, it is free from Sodium Chloride, Sulphate and Paraben. Apply on wet hair, lather and rinse, repeat if necessary. For best conditioning and protection follow with the Deep Nourishing Conditioner or the Nourishing Muru Muru butter treatment. Milk Shake Integrity Nourishing Conditioner, a deep conditioner for all hair types. Specifically formulated to condition and nourish every type of hair preserving the integrity of hair colour. It transforms your hair immediately, making it soft, shiny and healthy. This is achieved through the combined action of Muru Muru butter and the Amino acids complex, a mixture of plant amino acids developed to give damaged hair the right quantity of restructuring elements. The Amino acids complex works on the hair, restoring and protecting the hair structure, visibly improving the condition of damaged hair. With regular use the integrity system guarantees shine with it’s protective and polishing action and the final result is radiant and healthy hair. Apply and distribute Integrity Nourishing conditioner over clean damp hair. Comb and leave in for 2-3 minutes. Rinse well. Mlk Shake Integrity Intensive treatment is deep nourishing treatment for all hair types. A specific formula with organic Muru Muru butter that deeply nourishes the hair and eliminates frizz. It seals the cuticle and givessoftness, shine and de-tangles the hair whilst preserving the integrity of hair colour. Distribute over clean damp hair and then leave in for 3-5 minutes, comb it through and then rinse. For particularly damaged hair cover the hair with a cap and leave under a heat source for 5 minutes, cool off and then rinse. Mikl Shake Integrity Booster is a pre-shampoo protein treatment or, if you like a concentrated nourishing supplement that helps to preserve hair colour. It’s formulated with amino acid proteins is ideal to restructure and restore damaged or chemically treated hair. Integrity Booster contains organic Muru Muru butter for a conditioning and nourishing action. Shake the bottle well, before washing the hair and while it is still dry, spray the booster over the dry lengths and ends, dry with a blow dryer and then rinse with integrity nourishing shampoo. Milk Shake Integrity Hair Repairing Treatment is a revolutionary new hair conditioning treatment from Milkshake Hair Products. This treatment contains a highly concentrated protein and amino acids repairing system to restructure and strengthen damaged and chemically treated hair, for a soft and shiny result. Using ingredients to slightly open the cuticle of the hair, this treatment will deliver the necessary amino acids to repair damaged hair and condition it like no other hair conditioning treatment! This set contains 8 vials of the hair treatment to ensure that you can carry out the treatment as often and extensively as required. To use this treatment, simple empty the contents of the vial on to clean, damp hair. Massage the treatment into the hair and leave for 5-10 minutes before rinsing out. Milk Shake Integrity Nourishing Muru Muru butter for all hair types is a unique mixture that provides a deep nourishing treatment. It leaves the hair soft, nourished and shiny even after the first application. For very damaged hair distribute over dry lengths and ends before shampooing the hair, leave it in for 3-5 minutes. Rinse with integrity nourishing shampoo and continue the treatment with integrity nourishing conditioner or intensive treatment. For dry hair, mix integrity nourishing Muru Muru butter with integrity nourishing conditioner or intensive treatment, distribute over hair after shampooing, leave it in for 3-5 minutes, comb through and rinse. Milk Shake Argan shampoo with organic Argan oil and delicate surfactants (sulphates and sodium chloride free) for all hair types gently cleanses thanks to it’s unique formula. Silk proteins, rice and soya, act both in the internal and external part of the hair, strengthening and protecting its structure, clearly improving the condition of damaged hair. Hydrates, conditions and nourishes the hair instantly, eliminating frizz and static. Gentle on the skin and leaves hair soft and bright while preserving colour integrity. Apply to wet hair, distribute and rinse – repeat if necessary. For best results use with a Milk Shake conditioner. Milk Shake Argan Deep Treatment moisturises and soothes the cuticles. A deep hair treatment that leaves hair conditioned, manageable and soft, preserving colour integrity. It gives continuous hydration to skin and hair, preserving the water balance longer; deeply and instantly restructure the hair from both the inside and outside, eliminating the frizzy effect while enhancing resistance to chemical treatments, improving comb-ability, reducing split ends and giving brightness, softness and shine to the hair. Distribute on clean hair and massage. Leave on for 3 to 5 minutes, comb and rinse. Milk Shake Colour Maintainer Shampoo is a caring natural, gentle shampoo for all hair types designed specifically to maintain the freshness of your coloured hair for longer, ensuring your hair colour looks vibrant and healthy every day of the week. A professional, salon quality shampoo for coloured hair it is perfect for everyday use and will leave your hair soft, smooth and easy to control whilst being naturally gentle. Apply to wet hair, massaging into hair and scalp until there is a thick lather, rinse out and for best colour caring results follow up by using some Milkshake Hair Colour Maintainer Conditioner. Milk Shake Colour Maintainer Conditioner is a professional, salon quality conditioner for coloured hair that will leave your hair soft, smooth and easy to control and style. Colour Maintainer Conditioner is the perfect conditioner to use for Summer and Winter hair care alike. Coloured hair needs extra special care and protection from the elements, the added moisture from the milk proteins in Colour Maintainer will give your hair all of the gentle care it needs! Apply to clean, damp hair, combing through with your fingers, allow the conditioner to moisturise your hair for a few moments, rinse out and then you are ready to go and style as normal. Milk Shake Conditioning Whipped Cream is the perfect natural conditioner delivering hair that is soft, shiny and full of vitality. No need to rinse, for healthy and beautiful hair. Using proteins found in milk, the special ingredients give your hair the best possible start to each day by caring for each hair from the cuticle to the cortex. Use conditioning whipped cream for all hair types alongside a Milk Shake shampoo for hair that will look amazing, and feel even better all day, every day. Apply to damp, clean hair. Comb evenly through hair using fingers, no need to rinse out of hair, just leave it in! Milk Shake Leave-In Conditioner is the perfect conditioner for any type of hair and for on-the-go hair conditioning, so if you are in a rush, this conditioner will give your hair a health kick, ready to go out! Uses milk proteins to give each strand of hair the moisture it requires for a healthy look and shine with a softness that is easy to style. Leave-in conditioner means that you can apply this product to instantly get fresh and healthy looking hair. Spray mist all over hair and concentrate on areas which are damages, like split ends and dry patches! That’s it, no need to wash it out, leave-in, just style and go. Use this alongside Milkshake Hair’s shampoo’s to give your hair the best care you can, leaving you with touchably soft hair that is easy to manage and style. Milk Shake Volume Solution Shampoo gives strength and vitality to fine and limp hair, deeply nourishing and thickening the hair shaft, giving the hair increased volume and luminosity. Perfect for hair that is a little limp and lifeless, it will give your hair body, leaving it looking great and feeling healthy! Rub a small amount of Volume Solution Shampoo between your palms and apply liberally to wet hair. Lather thoroughly and rinse. Milkshake Volume Solution Conditioner gives your hair strength and vitality. This Conditioner uses active volumizing ingredients that work when in contact with Keratin in the hair to give your hair a boost and leaving it feeling silky smooth like velvet with amazing body that lasts. Apply and distribute uniformly through washed and towel dried hair. Seen another Milk Shake product you like? Just ask – we should be able to get it for you! Olaplex is a bond fixer and represents a massive step forward in helping maintain hair health and strength, particularly through the colouring process and when a big change is required in lightening the hair. 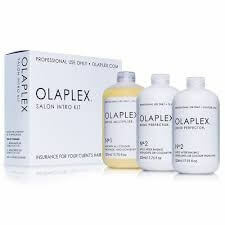 Olaplex maximises hair strength by reconnecting broken disulphide sulphur bonds in the hair, which gives it a thicker look and leaves the hair looking and feeling healthier and stronger. Hair bonds can break when hair is coloured and subject to regular heat and chemical treatments. Olaplex helps to rebuild the strength, structure and integrity of the hair and it is compatible with all hair types. Choose Olaplex as part of your colouring process or ask about our stand-alone treatment which combines Olaplex and Keratin. 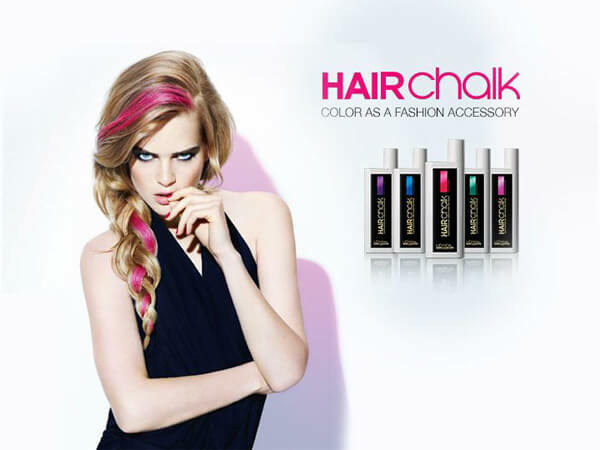 L’Oreal Professionnel Hairchalk is the fast and trendy way to liven up your hair colour and is available from just £5 at Hair Jungle hair salon, Plymouth. We love the craze for bold and brightly coloured hair. So we’re excited to unveil this great temporary hair colour! Available in 4 bold, show-stopping shades L’Oreal Professionnel Hairchalk allows you to accessorise with make-up and nails and change hair shades as often as you change your shoes! It washes out after a few shampoos. Bold on both blondes and brunettes, our range consists of Sweet Sixteen Pink, First Date Violet, Blue Ocean Cruise and Garden Party (Green). So get ready to brighten up the workplace, wow on a night out or just accessorise a pretty braid. Take a tube home for just £14.95 or spend £5 – £10 (depending on the amount used and we’ll apply it for you in the salon!). This lovely customer came in with large roots and brassy ends wanting the whole look toned down and more natural. So Hair Jungle Stylist, Chelsea wove through a gold/pearl and then darkened the rest to blend with the natural regrowth - Beautiful! Call for an appointment or pop in for a free, no obligation consultation and let one of our talented Hair Jungle stylists revamp your hair!